The Horizon 485 Scorpion rode smoothly and had a great high driving position. FAMILY orientated fishos are these days quite spoilt for choice when it comes to choosing a new rig to satisfy both their fishing aspirations and partner’s desires. With such a wide variety of boats on the market, to attract the eye of prospective buyers most brands ensure they have a point of difference that sets them apart from the rest. 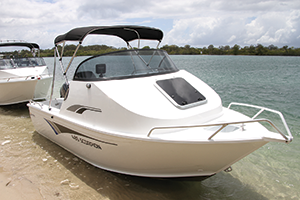 For Horizon Aluminium Boats, that key point is exceptional value for money, which the well-known Aussie boating brand has been delivering since 1992. 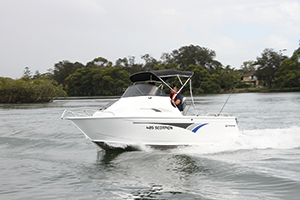 I recently ducked down to the Tweed River on a gloomy and windy day to check out the new-for-2018 Horizon 485 Scorpion Cuddy powered by Yamaha’s lightweight pocket rocket F60LB four-stroke outboard. First impressions had me wondering how well the relatively small four-cylinder would push along the chunkily proportioned Scorpion in the fast-flowing Tweed River. As soon as we hit the water, my concerns dissipated. 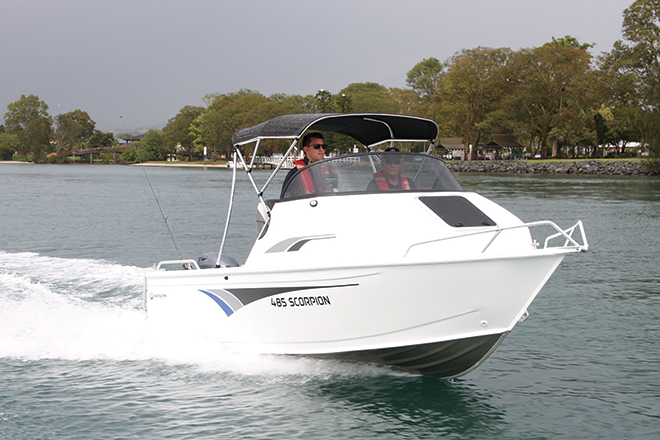 Running with the tide and with three people on board, the Scorpion quickly scooted out to about 50km/h (easily read on the crystal-clear Yamaha 6YC LCD information display), which would no doubt be plenty of performance for the average family fisho. The single overhead cam, 996cc Yamaha effortlessly pushed the 550kg (dry weight) Scorpion onto the plane and was whisper-quiet at all running speeds, allowing easy communication and even quality audio recordings of conversation in the cockpit at about 40km/h. The Horizon’s foam-filled Hydro Lift hull and 3mm bottom sheets no doubt played a part in this quiet ride too, with minimal wave noise and water rustling coming through the hull at speed. During testing, we mainly stayed in the calm waters of the mid-Tweed River, however any passing boat wakes were handled with ease both at full speed and cruise speed and no spray found its way over the sides. 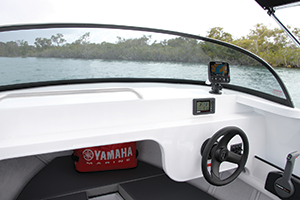 Yamaha’s performance testing of this boat and motor package revealed a swift cruising speed of 38.85km/h at 4500rpm to be the sweet spot, punching out an excellent 3.38km per litre fuel economy figure. With a 60-litre fuel tank, running the tank dry at that cruising speed would net you a 202km range, which is nothing to be sneezed at for a family friendly fishing rig. 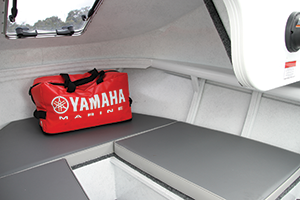 Internally, the Scorpion has a fully carpeted floor extending into the cabin. Speaking of the cabin, with a bow to transom length of 4.9m, the 485 Scorpion is not exactly what you’d class as a ‘big’ boat, however the cabin’s size and layout is ‘big boat style’. Extending forwards right up to the anchor well and then running aft until about midships, the cabin structure is no insignificant thing.The reason for such an accommodating cabin comes back to that philosophy of satisfying both the fisho within and keeping the family happy. The cabin provides ample storage under the cushions, and an optional bunk infill would turn the area into a perfect sleeping pad for the kids (there’s not quite enough length for an adult to lie flat). The 485 Scorpion is just as happy doing family duties as catering to serious fishos. Yamaha 60hp four-stroke provided ample punch on this budget setup. 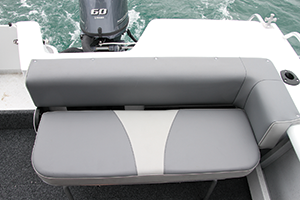 Fold-away rear lounge and heavily padded backrest make for an ideal place to sit while under way. 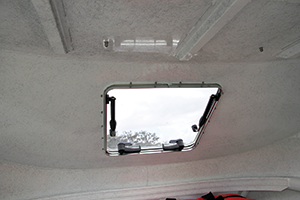 Strut-opening cabin hatch allows plenty of light to filter into the cabin and offers access to the anchor well. Cabin bunks aren’t quite long enough to sleep an adult, but are perfect for the kids once they’re tuckered out from a day on the water. Broad and clean dash layout provides endless options for fitting electronics and one-piece curved glass windscreen is a classy touch. Reverse chines effectively deal with spray and combine with the enveloping cabin to keep occupants totally dry while under way. A large, clear central hatch allows for natural light to enter the cabin, giving a greater sense of space, and provides access to the bow to make anchoring a breeze. The driving position too, feels airy and is up nice and high, giving a commanding view out over the waves. Heading out of the cabin and moving astern, a heavily padded backrest accompanies a fold-away three-quarter rear lounge, which makes chilling out down the back of the boat while under way a decidedly pleasant option. The final quarter of the stern area is occupied by a door that leads out to a non-slip boarding area replete with fold-up/down ladder for ease of entry and egress. So that’s the family taken care of, but what about the fisho? Well despite the fairly large cabin up the front of the 485 Scorpion, fishing room in the cockpit is not overly compromised, with loads of space for three or even four fishos with the rear lounge stowed away, thanks in part to a 2.2m beam. Behind the rear lounge is the battery, tucked neatly out of sight, and also absent from view is the fuel tank, which has been fitted under the floor. In summary, when it comes to value for money, you’ll be hard pressed to find better than a Horizon boat. 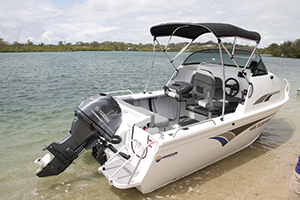 As tested with the bimini, Raymarine Dragonfly 5 Pro with chart, single battery and Yamaha 60hp four-stroke, the 485 Scorpion Cuddy is priced at just $32,990 drive away from Marine Tune on the Gold Coast. That’s outstanding value for a cuddy cabin boat with the ability to do inshore overnighters and keep the family entertained for hours on end. Will from Yamaha was even telling me this boat was pulling him around in a tube with no worries just a few days before our test. The perfect family rig for those on a budget? The Horizon 485 Scorpion Cuddy comes pretty darn close.